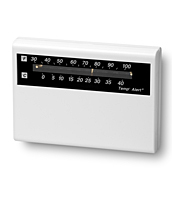 Reliable and economical temperature protection for residential or commercial security systems. Wire units in parallel for simple, wide-area coverage. Ideal for computer rooms, residential/vacation homes, greenhouses, animal buildings or unattended buildings. Monitor high and low temperature limits by setting an acceptable temperature range with high and low limit arms. Economical, sleek, low-profile temperature monitoring. Please Note: Not for use in cooler/freezer monitoring, instead choose an EnviroAlert® with probe.